One of the secrets to the HCG diet is the protocol, designed to maximize your body's fat burning potential. The HCG is a carefully designed diet protocol that maximizes weight loss.With the HCG diet,you can burn up to 4000 calories per day and consistently lose those kilograms. You can transform your body in only a short time. HCG is given as an injection under the skin with a very tiny insulin needle. The HCG diet is based on using your body's own hormones to trigger the system of releasing stored fat. In Dr Simeon's research he discovered that pregnant woman release a hormone which causes the body to rely on stored fat for energy instead of packing more fat away. By harnessing this hormone Dr Simeon learned, even people who weren't pregnant - including men - were able to release fat that had been stored for years, leading to rapid, effective and SAFE weight loss. HCG stands for Human Chorionic Gonadotropin, which is a naturally occurring hormone found in both men and women, but is produced in large amounts in pregnant females. The “pregnancy” hormone feeds and nourishes the fetus by releasing the fat stores until the placenta is fully developed. The hCG hormone almost completely controls a woman’s metabolic functions during her pregnancy. Dr. Simeons, author of Pounds and Inches manuscript, discovered the fact that in non-pregnant women using a small amount of hCG he could produce similar effects. Using daily HCG drops or injections for weight loss could similarly increases the metabolism, causing abnormal fat to be used and expelled. Dr. Simeons suggests that when taking hCG, in conjunction with a VCLD (very low calorie diet), abnormal fat is released from our bodies and our bodies are actually restructured along with our brains being taught to ‘rethink’ food and lifestyle habits being changed permanently. The ideal dosage of real hCG Dr. Simeons found to produce fat releasing is between 125 iu to 200 iu in both men and women. Daily injections or oral drops of real HCG would dramatically change the body in a few short weeks when following the guidelines in the Pounds and Inches manuscript. Dr. Simeons protocol food list is very specific when using hCG and must be not be altered for the greatest success and fat release in the shortest period of time. You can also use some or all of Kevin Trudeau‘s additions to the hCG diet to make it easier, reduce sugar and carb cravings, increase your fat loss and help suppress your appetite naturally. What are the Advantages of the HCG Diet? Weight loss is a major trend in today’s society. Unhealthy food is cheap and easy to get, and our lifestyles are increasingly more sedentary as time goes on. With the advent of computers and the internet, far more people than every before are able to make a living without resorting to manual labor. While the rate in which technology improves our lives is staggering, it is also helping to make our health even worse. If you find yourself wanting to lose weight, there is no better method than using real HCG hormone injections or real HCG drops in order to drop weight quickly and easily. The HCG diet does not require exercise I order to lose weight. If you find yourself already pressed for time, or just exhausted at the end of the day, then the HCG diet is here to the rescue. Weight loss is achieved through daily injections of the HCG hormone and a 500/800 calorie diet. The HCG releases stores of fat into the bloodstream to be used as energy throughout your day. Because the fat is released via the hormone injections, there is no need to spend hours in the gym sweating away your precious free time. The weight loss is extremely quick. There are several different varieties of HCG diets out there all designed to help you lose weight quickly and easily. The shortest HCG diet protocol lasts only 15 days and elicits weight loss results from 5 to 10 Kg’s . The longest lasts for 90 days and can help you lose up to 50 kilograms of body fat. You will not find results like these outside of the HCG diet community with the possible exception of liposuction, and who wants that? The 500 and 800 calorie diet comes with a list of approved foods. This list is contains no starches or sugars and consists of lean proteins, vegetables and fruit. If you’ve been looking for a way to eat healthier, but weren’t sure where to turn, this is it. Once you’re finished with the HCG diet, you might just find that you’ve acquired the knowledge necessary to continue eating a healthy, balanced diet in order to maintain your weight loss. The health benefits of losing weight are myriad. Weight loss has been shown to reduce the effects of type 2 diabetes in those who have been diagnosed, sometimes even eliminating them altogether. It’s easier to breath after losing weight as well. Also, your blood sugar levels will often stabilize and your risk for heart disease and type 2 diabetes will be dramatically reduced. Not to mention you will feel and look excellent! 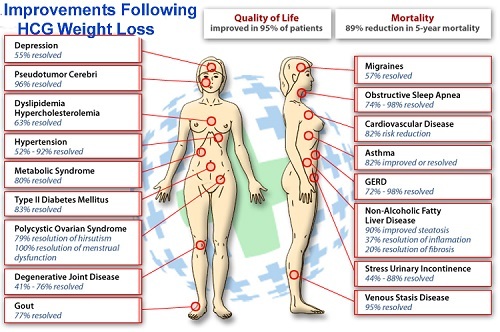 These are just some of the potential benefits of losing weight using real HCG. If you’re curious about trying the diet for yourself, or simply want more information then you are in the right place, there are many benefits associated with the HCG diet. You can also pick up the book Pounds & Inches by Dr. A.T.W. Simeons, the original researcher who first noticed the correlation between HCG and weight loss. If you’re still in need of HCG diet information we have included some website links for you to do more of your own research. HCG is a hormone secreted by the placenta during pregnancy (the same hormone detected in home pregnancy kits). It was first used to help weight loss because several physicians noted that overweight women actually lost weight when they were pregnant. More than a dozen medical studies have shown that combined with a low calorie diet , HCG increases fat loss and helps with loss of inches. By using a combination of VLCD (very low calorie diet) and HCG injections, the HCG diet focuses on losing and maintaining weight by shifting one's food intake to 500 Or 800 calories while taking daily injections of HCG, or the Human Chorionic Gonadotropin hormone. This combination helps to reset one's metabolism to ensure long-term weight loss. The HCG diet was originally developed by Dr. A.T.W. Simeons to aid clinically obese patients in quickly returning to a safer weight zone to avoid deadly health conditions. Research of 40 years and thousands of cases conducted by Dr. Simeons has lead to the concept of the HCG diet, which is meant to be a healthier interpretation and implementation of weight loss rather than the purely cosmetic, over-hyped diets of today. Unlike other mainstream diets, the HCG diet refocuses one's attention to smaller portions, less fatty foods, less fatty topical products and structured routines that promote more long-term weight-loss. It is not a diet solely for the purpose of losing weight to look good. The HCG diet is meant to promote a healthier lifestyle through careful consideration and use of less fatty foods and products. It is combined with rapid weight loss to help patients get back into safer weight zones so that they are out of immediate danger and can focus on the internal changes that will promote healthier living for years to come. There are several variations and protocols of the original HCG diet. However interpreted, the consumption of foods such as sweet fruits, starches, eggs and milk are carefully limited or omitted during the treatment process. The HCG diet also limits the use of certain topical products such as lotions, oily makeup and conditioners which contain fatty substances and harmful chemicals that may react with or defeat the purpose of the HCG.